The two-seater Beechcraft B19 plane was practicing landing, officials say. 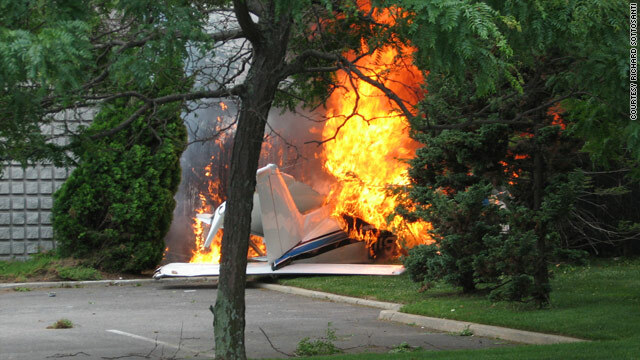 New York (CNN) -- The pilot of a small aircraft was practicing landing when the plane crashed into an office building and burst into flames in Long Island, New York, Saturday afternoon, authorities said. Emergency crews airlifted the pilot to Stony Brook University Hospital, where he was in serious condition with severe burns, according to Michael Stankunis, an assistant chief at the Bohemia Fire Department. An ambulance transported the passenger, who sustained less serious injuries, he said. The two-seater Beechcraft B19 plane was practicing landing at Islip MacArthur Airport in Bohemia, Long Island, and crashed half a mile from the end of the runway just after 3 p.m., FAA spokesman Jim Peters told CNN. A civilian helped pull the pilot and passenger from the aircraft, Stankunis said. There were conflicting reports about whether a third person had been injured in the crash. Peters said a person on the ground was injured, but Suffolk County Police said only the pilot and passenger sustained injuries. Two businesses sustained minor damage, a Suffolk County Police spokeswoman said. Richard Sottosanti, owner of nearby business RMS Off Road Inc., said the plane snagged a power line and then slid into the ground, eventually hitting a commercial building. "We heard the noise and immediately ran up the street to see if we could be of any assistance," he said. The FAA is currently investigating the incident.